The thing we like the most of the Jim Shore Disney Traditions line by Enesco is that it’s a wide cauldron that contains depictions of characters that range from the usual Mickey and Minnie giftware poses, widely available everywhere, to the more rarely seen characters from Disney films of the 70’s like Pete’s Dragon, The Rescuers or Robin Hood. Some of these sets are also quite hard to get as they are not usually available worldwide or they are more limited in quantities produced. 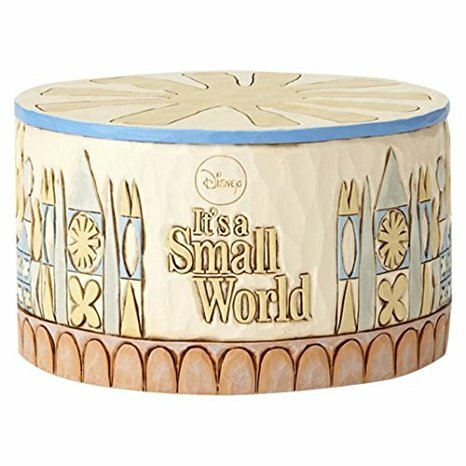 Today we are giving a glance to the collection that Jim Shore has devoted to one of the most loved park rides ever: It’s A Small World. As everyone knows the ride features animatronic children and animals, dressed up in traditional costumes from cultures around the world, singing the notorius song about unity and peace, with the lovely design by artist Mary Blair, who was the art director on many animated films like Alice In Wonderland, Cinderella and Peter Pan. This is the second collecting line inspired by this park ride, after the precious releases from the now defunct Walt Disney Classic Collection (WDCC) by Disney/Enesco. And this time the price tag is more affordable too! Will be there more releases from this series? we highly hope so! in the mean time here’s a photo of our own display of these figurines from our collection.